Tournament hosts China leads the top seeds to the 2019 FIBA ​​Basketball World Cup. FIBA ​​World. FIBA ​​World Ranking has been updated following the final qualifying window for the 2019 FIBA ​​Basketball World Cup. The latest version of the ranking serves as a basis for determining seeds and pots for the drawing of the first 32-hold world championship. 1; the United States, Spain, France, Serbia, Argentina, Lithuania and Greece. The complete drawing procedures that will be based on ranking and geographical principles will be revealed during the week leading up to the next milestone event on the way to China 2019. The top 9 teams remain unchanged while Russia (525, 3 points) moved up to complete the top 10. This is partly because Sergey Bazarevich's prosecutor goes 2-0 in their last two matches with European qualifiers to ensure their return to the World Cup after missing out in 2014. Russia's win is Australia's los s as Boomers (515.0) fall to No. 11 after splitting (1-1) the last two games in their Asian qualifying campaign. Senegal moves up two places to No. 37 at the back of winning their last three African Qualifiers game to clear their World Cup place. The Philippines remains at 31 at 317.6 points. Gilas Pilipinas is the fourth ranked team in Asia, just behind Australia, Iran and China. 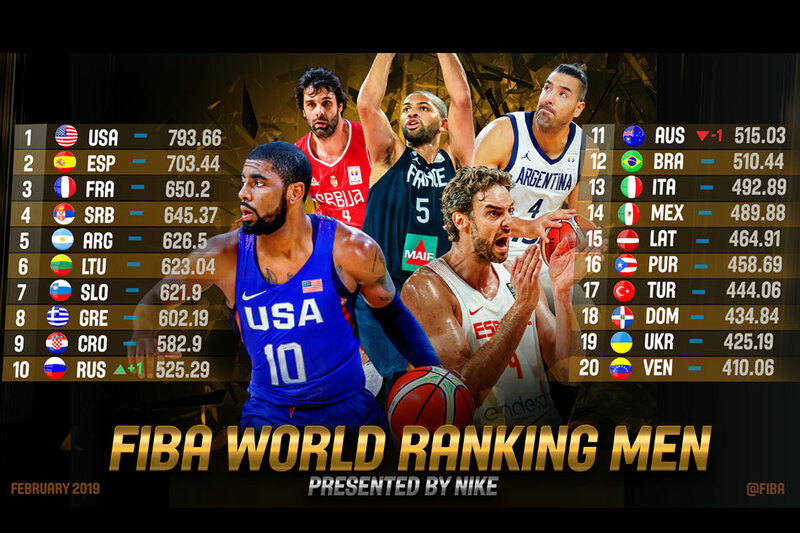 FIBA ​​World Ranking will be updated next after the completion of the FIBA ​​Basketball World Cup, which will be held on August 31 to September 15. The rating points of games are taken into account in the top official FIBA ​​competitions and their qualifiers over an eight-year period.